Back to back weekends vs #1 and #2. We play 50% of the Top 10 in conference series. I guess the only positive thing is those are home series and you hope to steal at least one game in each series. But a long season before then. Praytor just hit a 2-run bomb, driving in Breaux. Bama 2-0 in B1. 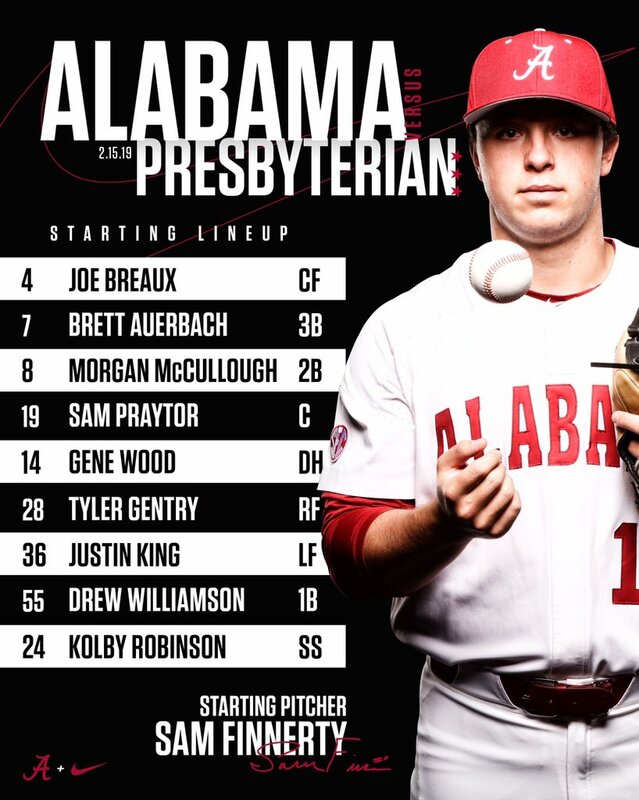 Interesting to me that Holcombe, after giving up football to focus on baseball entirely, isn't in the lineup. He had a very solid season last year, and it's only game one, but I'd qualify that as at least a mild surprise. Lots of new faces among the regulars. Hopefully they play well. Robinson slaps one into left field to score Gentry. Bama has 1st & 2nd, up 3-0, B2. Good point. Had forgotten about that. Breaux with a hard-hit liner into center loads the bases. Breaux 2-for-2 now. I got it for another 25 minutes or so. Gotta duck about 4:00. Auerbach draws a bases-loaded walk. 4-0 Bama. Bases still loaded. 3-hole McCullough up with one out. McCullough sac fly into deep left to score Robinson from 3rd. 5-0 Bama. Praytor up with men on 1st & 2nd. 2 outs. Bama on top 5-0 headed to the third. I'm going to duck out at this point. The WatchESPN link that biggsc posted is working really well if anyone is interested.